Home > Research > Is cancer-causing formaldehyde in your cosmetics? Exposing the Cosmetics Cover-up: Is cancer-causing formaldehyde in your cosmetics? Does a chemical that may cause cancer lurk in your cosmetics? 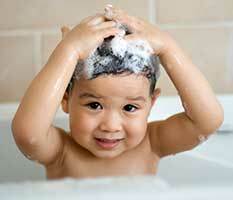 Worse, in your kid’s personal care items? Maybe. According to data from the federal Food and Drug Administration, nearly 1 in 5 cosmetic products contains a substance that generates formaldehyde, a known human carcinogen. The product label won’t tell you if formaldehyde is present, even though the manufacturer has made sure a small amount of it is inside in the jar or bottle, to prolong shelf life. As everybody who has ever dissected a frog in biology class knows, formaldehyde is an effective preservative. But the U.S. government and World Health Organization have classified formaldehyde as carcinogenic when its fumes are inhaled. It is also a potent skin sensitizer and allergen. Cosmetics companies generally don’t dump pure formaldehyde into their concoctions. Instead, they take a roundabout route by using what they call “preservative systems” that employ any one of several chemicals, called “formaldehyde releasers.” These are chemicals that, when added to water, will decompose slowly over time to form molecules of formaldehyde. Some manufacturers favor this method because it acts like a time-release capsule, maintaining a fairly constant level of preservative in the mix. The reactions that generate formaldehyde occur silently as the products sit on shelves in stores or bathroom cabinets. The FDA does not restrict the amount of formaldehyde that can be present in cosmetics sold in the U.S. But the American personal care industry’s ingredient safety panel, the Cosmetic Ingredient Review, has issued voluntary guidelines that echo the European Union’s legally enforceable directive, which bars more than 0.2 percent formaldehyde in personal care products. The European Union’s policies are better than the FDA’s, but they do not completely protect people against cosmetic chemicals that may induce allergic reactions. The EU allows personal care products to contain up to 2,000 parts per million of free formaldehyde. That’s more than enough free formaldehyde to cause dermatitis, an inflammation of he skin. Concentrations of formaldehyde as low as 200 to 300 parts per million have been shown to trigger dermatitis. Like formaldehyde itself, formaldehyde-releasing chemicals are allergens. To be sure, the amount of formaldehyde in a cosmetic product at any given time is tiny. The cancer risks presented by a cosmetic could be considered slight -- but that product is not a person’s only source of exposure. People are also exposed to formaldehyde by pressed-wood products, cigarette smoke, vehicle exhaust and unvented fuel-burning appliances such as gas stoves, wood-burning stoves and kerosene heaters according to the National Cancer Institute and the Environmental Protection Agency. Personal care products that contain formaldehyde make an unnecessary contribution to an individual’s exposure to this chemical – particularly since research shows that cosmetic products can release small amounts of formaldehyde into the air shortly after they are applied. Formaldehyde is most dangerous when inhaled. Cosmetics need preservatives to prevent the growth of bacteria. But formaldehyde releasers are not the only option. Last year Johnson & Johnson, one of the world’s largest manufacturers of baby care and adult skin and hair care products, announced it would cease adding formaldehyde releasers to its products. There are safer substitutes such as sodium benzoate. How can you avoid formaldehyde in your products? Check the label carefully, both for the ingredient formaldehyde itself and for the seven common formaldehyde releasers listed above. Or let EWG do the research for you. Check out the products in EWG’s Skin Deep Cosmetics Database. It contains information on more than 77,000 products and their ingredients. The database, searched more than 200 million times by savvy consumers, highlights toxic substances like formaldehyde — and those insidious formaldehyde releasers. And watch for the Skin Deep mobile app, coming soon!